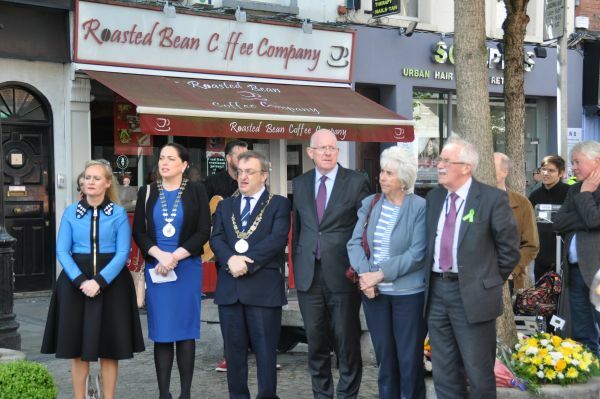 The 44th anniversary of the Dublin/Monaghan bombings was commemorated on Thursday, 17 May with a wreath-laying ceremony at the Memorial, Talbot Street. 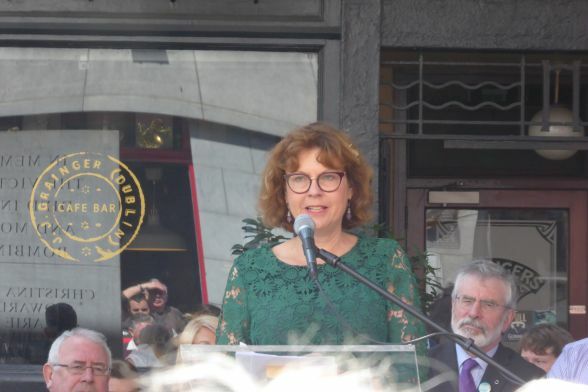 Aidan Shields, whose mother, Maureen, was killed in Talbot Street, acted as Master of Ceremonies. The names of the victims were read by Margaret Urwin and a minute’s silence was observed to remember all the victims of the conflict. Wreaths were laid by the Lord Mayor of Dublin, Árdmhéara Micheál MacDonncha; Mr. Charles Flanagan TD, Minister for Justice and Equality and Cllr Cathy Bennett, Cathaoirleach of Monaghan County Council. Michelle O’Brien, whose mother was killed in Talbot Street, laid the wreath on behalf of Justice for the Forgotten. A wreath on behalf of the Pat Finucane Centre was laid by Director, Paul O’Connor. Susan McKay, journalist and author, gave the annual oration. Survivor Noel Hegarty read his own poem. 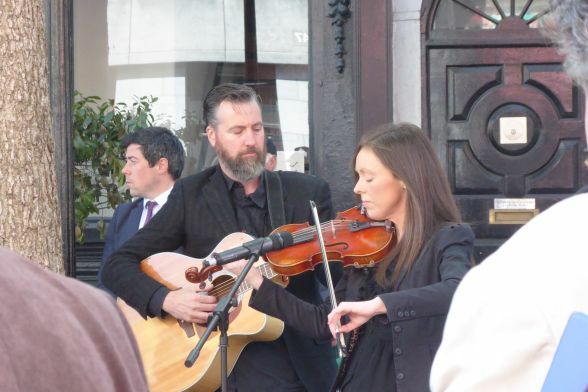 The prayers were led by Fr Tom Clowe and music was provided by fiddler Anna Mary Donaghy and guitarist Billy Treacy. Mass was celebrated afterwards by Fr Clowe in St Mary’s Pro-Cathedral. The Glenanne cases include the Dublin/Monaghan, Dundalk and Castleblayney bombings, as well as the murder of John Francis Green in the Republic of Ireland. It is, for the first time, a legal acknowledgement that their relatives’ lives were taken by state forces duty and honour-bound to uphold the law and protect life. The families, the Pat Finucane Centre/Justice for the Forgotten and their lawyers had given the court indisputable evidence (including ballistics and other forensic details) drawn from over 50 reports from the Historical Enquiries Team (HET); from the reports ordered by the Irish government, conducted under Judge Henry Barron, and catalogued in the book Lethal Allies: British Collusion in Ireland. It is troubling that the bereaved families themselves have been forced to litigate to uphold their basic right to an effective investigation, particularly so that such litigation arose from an investigation started by officers from England, but later discontinued by the PSNI. The HET had promised the families a thematic report into what has become known as the "Glenanne Series" of murders. Once this report was 80% concluded, however, it was without good reason suppressed. It remains unfinished. The families have yet to receive any acknowledgement, let alone apology, from the British government for its role in the murder of their loved-ones. Let there be no confusion about this ruling. Today, Mr Justice Treacy has concluded that the RUC and the largest regiment in the British Army at the time, the UDR, have a case to answer against credible charges of mass murder. He has confirmed what the families always knew to be true, that their loved ones were the victims of state-sponsored murder. Now the court has ruled that the families had a legitimate expectation and right to an independent investigation, the ball is in the British government’s court to find an equally independent mechanism to conclude the work. We look forward to hearing the government’s proposals without any further obfuscation and delay. For further reference here is the summary judgements page for the court in Belfast, at the courts website. The summary in this case is listed under "Court finds Chief Constable breached article 2 by failing to produce HET Report into activities of Glenanne Gang", dated 28 July 2017. It is available in an MS Word document format as well as a PDF document. For your convenience, the summary is also available here on our website as a pdf file. Denis Bradley, (pictured above), former Vice-Chairman of the Northern Ireland Policing Board and former Co-Chairman of the Consultative Group on the Past, delivered the annual oration to mark the 43rd anniversary of the Dublin/Monaghan bombings. Brendan Carr, the Lord Mayor of Dublin, Charles Flanagan TD, Minister for Foreign Affairs & Trade and PJ O’Hanlon, Cathaoirleach of Monaghan County Council, laid wreaths. Minister Flanagan renewed his call on the British Government to release their undisclosed files to an independent judicial figure. He said: "I know that the pain of the families and of the survivors continues to endure. That pain is compounded by the absence – after more than four decades – of the full truth of what happened." The prayers were led by Fr. Tom Clowe. Music and song was by Cormac Breatnach, Eoin Dillon and Ciarán Warfield. Survivor Noel Hegarty read his own poem. Justice for the Forgotten wishes to thank all those who came along to support the families and survivors and to show their solidarity with them. The 43rd anniversary of the Dublin and Monaghan bombings will take place on Wednesday, 17th May 2017. The Commemorative Mass in St. Mary's Pro-Cathedral, Dublin, will be at 11am. It will be followed by the Wreath-laying ceremony at the Talbot Street memorial in Dublin at 12.30pm. Further details later. 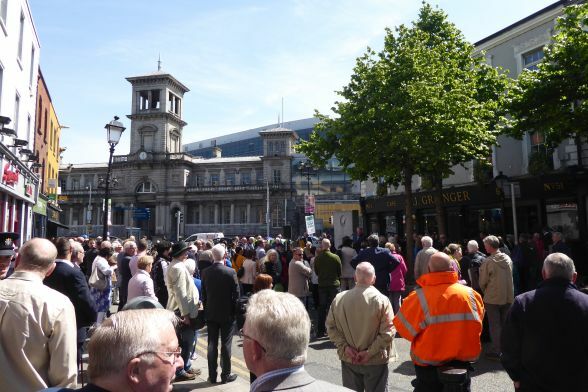 Justice for the Forgotten appeals to the people of Dublin to show their solidarity with the bereaved families and injured survivors by attending these commemorative ceremonies. Families and survivors of the Dublin and Monaghan, Dundalk, Castleblayney, Belturbet and Dublin bombings of 1972 and 1973 are taking civil cases against the Secretary of State for Northern Ireland, the Ministry of Defence and the Chief Constable of the PSNI. In the Dublin and Monaghan case, the British authorities have been ordered to lodge their defence by 24th April 2017. For further reference here is a link to a related Irish Times article about the recent High Court date in Belfast in March 2017. There was a wonderful gathering of the people of Castleblayney to mark the 40th anniversary of the death of Patrick Mone in a no-warning car bomb explosion in the town on 7th March 1976. A wreath-laying ceremony took place at the memorial dedicated to Patrick's memory. Included in the photograph above are Tommy Mone, nephew of the late Patrick, Anna Mone-McEneaney, widow of Patrick and Deputy Caoimhghín Ó Caoláin, TD for Cavan-Monaghan. The Police Ombudsman for Northern Ireland is currently investigating the Dublin and Monaghan, Dundalk and Castleblayney bombngs, the Miami Showband murders and the John Francis Green murder as part of the Glenanne series of murders which were committed by permutations of the same gang, comprising members of the RUC, UDR and UVF in the 1970s. A number of the UVF members were agents of the British intelligence and RUC Special Branch. We expect the completion of Dr. Michael Maguire's investigation and the publishing of his report within the next two years. Our co-ordinator Margaret Urwin's book, A State in Denial: British collaboration with loyalist paramilitaries, was published by Mercier Press on 7th October 2016. Launches have, so far, been held in Belfast, Dublin, Derry, Armagh, Newry, Galway, Shannon, Fermanagh and Monaghan. Based on research by the Pat Finucane Centre and Justice for the Forgotten and using official British and Irish declassified documents from the 1970s and early 1980s, this book explores the tangled web of relationships between British Government ministers, senior civil servants, leading police and military officers and UDA and UVF paramilitaries. The documents provide evidence of more than a decade of official toleration, and at times encouragement, of loyalists, leading to horrifying results and prolonging the Northern Ireland conflict. The book is available in all good bookshops and on Amazon and Mercier Press websites. Book review by Tom Griffin on Spinwatch here. Filming in Dublin with Seán Murray for his forthcoming film, which is based on our colleague, Anne Cadwallader's book, Lethal Allies. Included in the photograph with Seán and his colleagues are Fiona Ryan, whose mother, Maureen Shields, was killed in Talbot Street, Derek Byrne, who was seriously injured in Parnell Street and Margaret Urwin, co-ordinator of Justice for the Forgotten.